Each time a youth is confirmed, he or she takes his or her place in the wider community of faith. During the 8th grade year, youth wanting the Sacrament of Confirmation must attend monthly classes. Classes are held September through April, and the Confirmation Ceremony is usually held in May of each year. 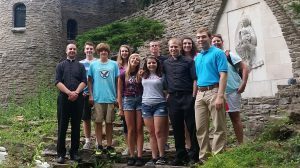 The classes and activities are designed to fulfill the requirements established by the Archdiocese of Indianapolis. 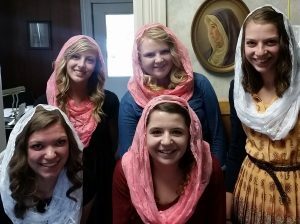 All youth group activities are sponsored by The Sons and Daughters of St. Gabriel. These groups were created to further individual Catholic faith formation after Confirmation, to also be a part of a Catholic youth community, cultivate leadership skills and nurture vocational discernment. All high school and middle school youth are encouraged to join these groups. All programming and activities are decided by the youth for the youth with assistance of adult advisors. Each group elects officers who have various responsibilities. Their focus is to serve God and His Church at our local parish using their many gifts and abilities. They strive to be examples of good Christian sons and daughters in our parish and to help inspire the faithful in a reverent and prayerful liturgy. Each group has established 5 levels within the group. Each level requires additional duties and responsibilities but it is not mandatory that they move up in levels. The Daughters wear a certain color infinity scarf/veil depending on their level. These are worn around the neck or as a veil on the head during the Masses that are led by theses groups, usually the second Sunday each month. 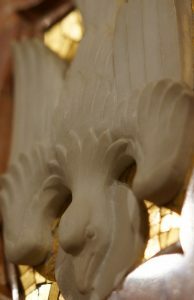 More information about Archdiocese of Indianapolis youth ministry can be found at www.archindyym.com.